Anything else is not protected! 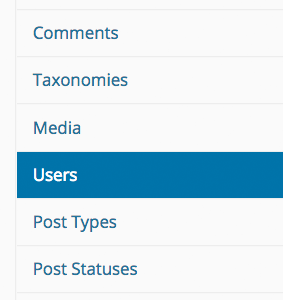 This includes pulling and displaying custom fields for that Post. Theoretically, this makese sense, as WordPress works by functions, and cannot be expected to know what's going on in every single custom theme. However, custom fields can potentially contain important information that you might want to be hidden via password protection. The ID's values for you will be different, but that's the gist of it. This is a bit of a tangent, but let's say you want to style this form. Good luck, form itself nor the labels or inputs have any class names or ID's that you can latch onto to style while not potentially affecting other forms. I thought about the body_class function for a moment, thinking perhaps password protected posts at least get a class for this, but no dice. 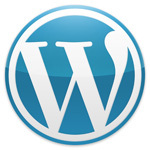 I think this is a problem... WordPress should get us some hook here! We'll use jQuery for this, because it makes it easy and that's just how I roll. The example below is taken from a site I worked on recently where I was displaying an audio track with custom fields, which was displaying even when the current post was protected. If it's not obvious, this will also remove the "Private: " from being appended to private post titles. You can use $is_protected within the template (for protecting custom fields) or filtering the post with the hook the_content. Give the filter a high number for priority (which means that it actually has a low priority) so you filter also changes made by other plugins. That’s interesting I’ll have to give that a shot. Protecting using PHP via the template itself is clearly a better solution. The above was manufactured in a pinch when I didn’t see any other way of getting it done. Uh yeah that’s WAY easier. I had no idea this function existed. I just tested it out on a site I was using the technique in this article and it worked great. I’ll update the article. 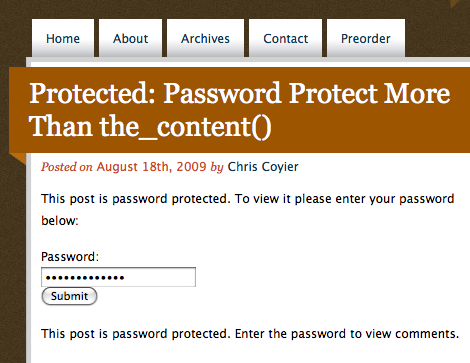 .. your custom php code or whatever ..
Quick easy way to password protect any content in your templates. Where exactly do I put the php-function in the update-box? I have some password-protected pages and I allow comments to be made by people who know the password. So far, so good. But I also have a “Recent Comments” widget in my sidebar, and that allows people who don’t have the password to see comments on password-protected pages. Can this be rectified?